Last night we heard that the One Laptop Per Child program would be showing off its long-awaited XO-3 tablet at CES. We’ll be getting a hands-on then, but they were kind enough to send out a couple pictures of the device this morning, and they seem worth sharing. As you may recall, the tablet has an 8″ screen, so with that for scale, it looks to be about three quarters of an inch thick. The bright green material appears to be silicone, and the rest of the construction will be plastic. The project’s founder, Nicholas Negroponte, wanted the device to be “indestructible,” and it certainly doesn’t look dainty, but it also doesn’t appear to be waterproof — though the front part could certainly be water-resistant. The silicone case is nice, and likely produces the indestructibility Negroponte covets. It’s not simply a box-top; you can see in the picture above (high resolution versions below) that one side has a curved cut in it; this will allow the user to choose whether the ports on the top are exposed or protected. Useful for all manner of things, I’m sure. The pattern on it looks like a solar cell, but it seems unlikely that an array of any efficiency could be shipped for as low a price as they’d want. Lastly there are the ports themselves: power, full-size USB (good for accessories), two ports which are likely audio out and in (or possibly both out, I can see that being a requested feature), and something that looks like a MicroSD slot, though I can’t be sure. There also appears to be a front-facing camera at the top. 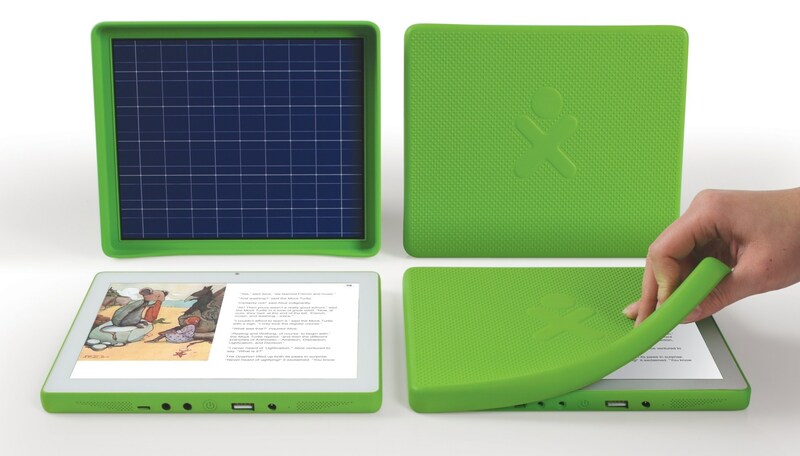 We’ll have more info at CES or as OLPC sends it our way.